The Chechen Republic (; Russian: Чече́нская Респу́блика, Chechenskaya Respublika; [tɕɪˈtɕɛnskəjə rʲɪˈspublʲɪkə]; Chechen: Нохчийн Республика, Noxçiyn Respublika), commonly referred to as Chechnya (; Russian: Чечня́; [tɕɪˈtɕnʲa]; Chechen: Нохчийчоь, Noxçiyçö), is a federal subject (a republic) of Russia. It is located in the North Caucasus, situated in the southernmost part of Eastern Europe, and within 100 kilometres (62 miles) of the Caspian Sea. The capital of the republic is the city of Grozny. As of the 2010 Russian Census, the republic was reported to have a population of 1,268,989 people; however, that number has been questioned by multiple demographers, who think such population growth after two deadly wars is highly implausible. After the dissolution of the Soviet Union in 1991, the Chechen-Ingush ASSR was split into two parts: the Republic of Ingushetia and the Chechen Republic. The latter proclaimed the Chechen Republic of Ichkeria, which sought independence. 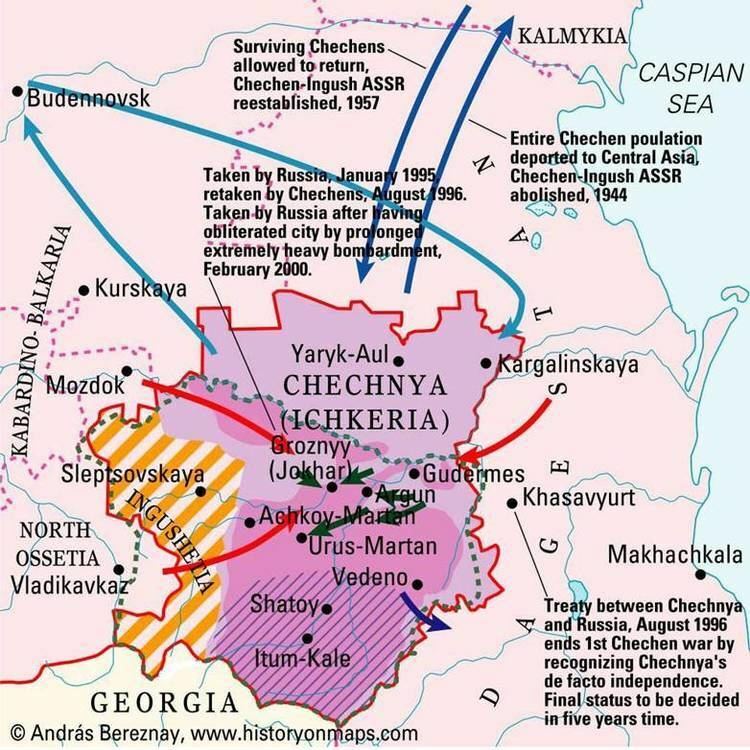 Following the First Chechen War with Russia, Chechnya gained de facto independence as the Chechen Republic of Ichkeria. Russian federal control was restored during the Second Chechen War. Since then there has been a systematic reconstruction and rebuilding process, though sporadic fighting continues in the mountains and southern regions of the republic. American linguist Dr. Johanna Nichols "has used language to connect the modern people of the Caucasus region to the ancient farmers of the Fertile Crescent" and her research suggests that "farmers of the region were proto-Nakh-Daghestanians." Nichols stated: "The Nakh–Dagestanian languages are the closest thing we have to a direct continuation of the cultural and linguistic community that gave rise to Western civilization." Dr. Henry Harpending, University of Utah, supports her claims. People living in prehistoric mountain cave settlements used tools, mastered fire, and used animal skin for warmth and other purposes. Traces of human settlement that date back to 40,000 BC were found near Lake Kezanoi. Cave paintings, artifacts, and other archaeological evidence indicates continuous habitation for some 8,000 years. 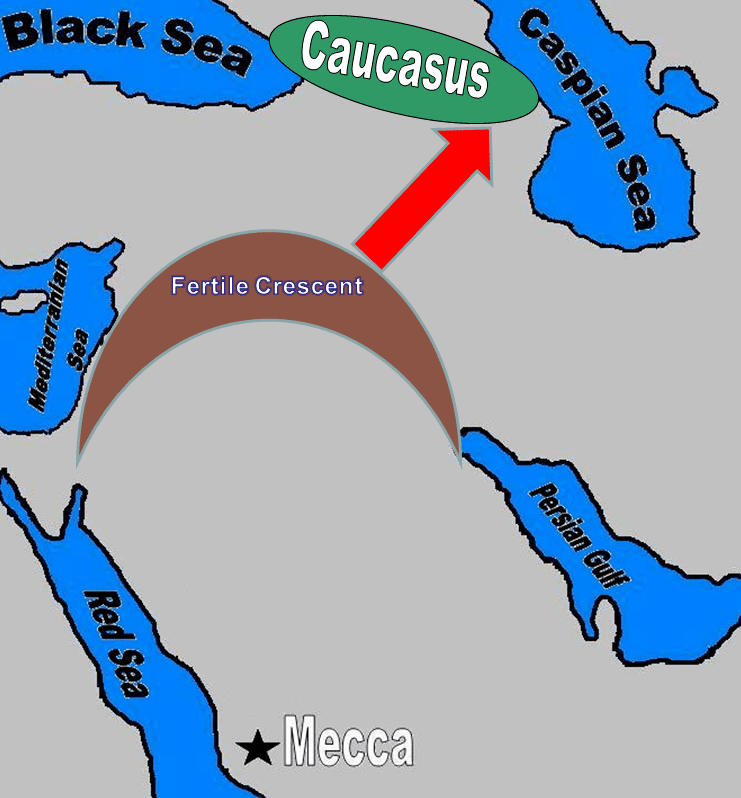 Migration of Nakh peoples to the slopes of the Caucasus from the Fertile Crescent. Invention of agriculture, irrigation, and the domestication of animals. Neolithic era. Pottery is known to the region. Old settlements near Ali-Yurt and Magas, discovered in the modern times, revealed tools made out of stone: stone axes, polished stones, stone knives, stones with holes drilled in them, clay dishes etc. Settlements made out of clay bricks discovered in the plains. In the mountains there were discovered settlements made out of stone and surrounded by walls; some of them dated back to 8000 BC. As Russia set off for the first time to increase its political influence in the Caucasus and the Caspian Sea at the expense of Safavid Persia, Peter I launched the Russo-Persian War (1722–1723), in which Russia succeeded in taking much of the Caucasian territories from Iran for several years. Notable in Chechen history, this particular Russo-Persian War marked the first military encounter between Imperial Russia and the Vainakh. The resistance of the Nakh tribes never ended and was a fertile ground for a new Muslim-Avar commander, Imam Shamil, who fought against the Russians from 1834 to 1859 (see Murid War). In 1859, Shamil was captured by Russians at aul Gunib. Shamil left Boysangur Benoiski, a Chechen with one arm, one eye, and one leg, in charge of command at Gunib. Benoiski broke through the siege and continued to fight Russia for another two years until he was captured and killed by Russians. The Russian tsar hoped that by sparing the life of Shamil, the resistance in the North Caucasus would stop, but it did not. Russia began to use a colonization tactic by destroying Nakh settlements and building Cossack defence lines in the lowlands. The Cossacks suffered defeat after defeat, and were constantly attacked by mountaineers, who were robbing them of food and weaponry. The tsarists' regime used a different approach at the end of the 1860s. They offered Chechens and Ingush to leave the Caucasus for the Ottoman Empire (see Muhajir (Caucasus)). It is estimated that about 80% of Chechens and Ingush left the Caucasus during the deportation. It weakened the resistance which went from open warfare to insurgent warfare. One of the notable Chechen resistance fighters at the end of the 19th century was a Chechen abrek Zelimkhan Gushmazukaev and his comrade-in-arms Ingush abrek Sulom-Beck Sagopshinski. Together they built up small units which constantly harassed Russian military convoys, government mints, and government post-service, mainly in Ingushetia and Chechnya. Ingush aul Kek was completely burned when the Ingush refused to hand over Zelimkhan. Zelimkhan was killed in the beginning of the 20th century. The war between Nakh tribes and Russia resurfaced during the times of the Russian Revolution, which saw the Nakh struggle against Anton Denikin, and later against the Soviet Union. On December 21, 1917, Ingushetia, Chechnya, and Dagestan declared independence from Russia and formed a single state: "United Mountain Dwellers of the North Caucasus" (also known as Mountainous Republic of the Northern Caucasus) which was recognized by major world powers. The capital of the new state was moved to Temir-Khan-Shura (Dagestan). Tapa Chermoyev, a prominent Chechen statesman, was elected the first prime minister of the state. The second prime minister elected was Vassan-Girey Dzhabagiev, an Ingush statesman, who also was the author of the constitution of the republic in 1917, and in 1920 he was re-elected for the third term. In 1921 the Russians attacked and occupied the country and forcefully absorbed it into the Soviet state. The Caucasian war for independence restarted, and the government went into exile. During Soviet rule, Chechnya and Ingushetia were combined to form Chechen-Ingush Autonomous Soviet Socialist Republic. In the 1930s Chechnya was flooded with many Ukrainians fleeing the Holodomor. 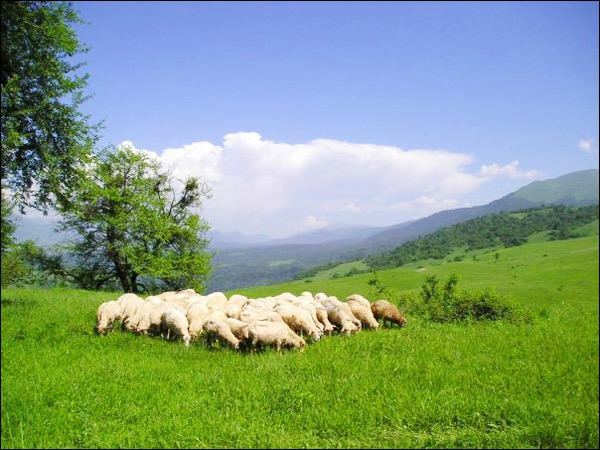 As the result many of the Ukrainians settled in Chechen-Ingush ASSR permanently and survived the famine. Troops assembled villagers and townspeople, loaded them onto trucks – many deportees remembered that they were Studebakers, fresh from Lend-Lease deliveries over the Iranian border – and delivered them at previously designated railheads. …Those who could not be moved were shot. …[A] few fighters aside, the entire Chechen and Ingush nations, 496,460 people, were deported from their homeland. 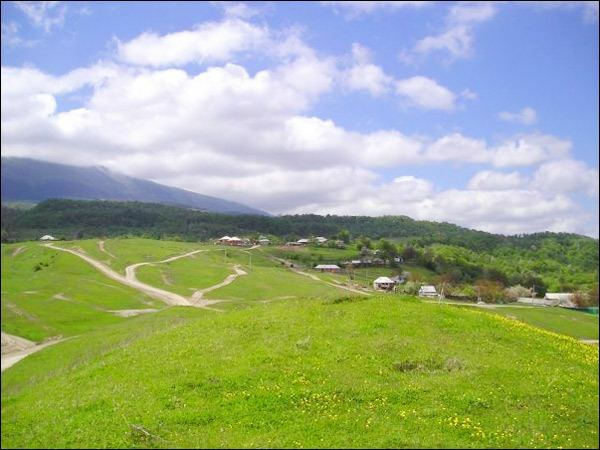 The Chechens and Ingush were allowed to return to their land after 1956 during de-Stalinization under Nikita Khrushchev when Chechen-Ingush Autonomous Soviet Socialist Republic was restored but both boundaries and ethnic composition of the territory significantly changed. There were many (predominantly Russian) migrants from other parts of the Soviet Union, who often settled in the abandoned family homes of Chechens and Ingushes. The republic lost its Prigorodny District which transferred to North Ossetian ASSR, but gained predominantly Russian Naursky District and Shelkovskoy District that is considered the homeland for Terek Cossacks. With the impending dissolution of the Soviet Union in 1991, an independence movement, the Chechen National Congress, was formed, led by ex-Soviet Air Force general and new Chechen President Dzhokhar Dudayev. It campaigned for the recognition of Chechnya as a separate nation. This movement was opposed by Boris Yeltsin's Russian Federation, which argued that Chechnya had not been an independent entity within the Soviet Union—as the Baltic, Central Asian, and other Caucasian States had—but was part of the Russian Soviet Federative Socialist Republic and hence did not have a right under the Soviet constitution to secede. It also argued that other republics of Russia, such as Tatarstan, would consider seceding from the Russian Federation if Chechnya were granted that right. Finally, it argued that Chechnya was a major hub in the oil infrastructure of the federation and hence its secession would hurt the country's economy and energy access. The First Chechen War took place over a two-year period that lasted from 1994 to 1996, when Russian forces attempted to regain control over Chechnya, which had declared independence in November 1991. Despite overwhelming numerical superiority in men, weaponry, and air support, the Russian forces were unable to establish effective permanent control over the mountainous area due to numerous successful full-scale battles and insurgency raids. In three months, Russia lost more tanks (over 1,997 tanks) in Grozny than during the Battle of Berlin in 1945. The Budyonnovsk hospital hostage crisis in 1995 shocked the Russian public and led to international condemnation of the Chechen rebels. In April 1996 the first democratically elected president of Chechnya, Dzhokhar Dudayev, was killed by Russian forces using a booby trap bomb and a missile fired from a warplane, after he was located by triangulating the position of a satellite phone he was using. The widespread demoralization of the Russian forces in the area and a successful offensive to re-take Grozny by Chechen resistance forces led by Aslan Maskhadov prompted Russian President Boris Yeltsin to declare a ceasefire in 1996, and sign a peace treaty a year later that saw a withdrawal of Russian forces. After the war, parliamentary and presidential elections took place in January 1997 in Chechnya and brought to power new President Aslan Maskhadov, chief of staff and prime minister in the Chechen coalition government, for a five-year term. Maskhadov sought to maintain Chechen sovereignty while pressing the Russian government to help rebuild the republic, whose formal economy and infrastructure were virtually destroyed. Russia continued to send money for the rehabilitation of the republic; it also provided pensions and funds for schools and hospitals. Most of these funds were taken by Chechen authorities and divided between favoured warlords. Nearly half a million people (40% of Chechnya's prewar population) had been internally displaced and lived in refugee camps or overcrowded villages. There was an economic downturn. Two Russian brigades were permanently stationed in Chechnya. The War of Dagestan began on August 7, 1999, during which the Islamic International Brigade (IIPB) began an unsuccessful incursion into the neighbouring Russian republic of Dagestan in favor of the Shura of Dagestan which sought independence from Russia. In September, a series of apartment bombs that killed around 300 people in several Russian cities, including Moscow, were blamed on the Chechen separatists. Some journalists contested the official explanation, instead blaming the Russian Secret Service for blowing up the buildings to initiate a new military campaign against Chechnya. In response to the bombings, a prolonged air campaign of retaliatory strikes against the Ichkerian regime and a ground offensive that began in October 1999 marked the beginning of the Second Chechen War. Much better organized and planned than the first Chechen War, the Russian military took control over most regions. The Russian forces used brutal force, killing 60 Chechen civilians during a mop-up operation in Aldy, Chechnya on February 5, 2000. 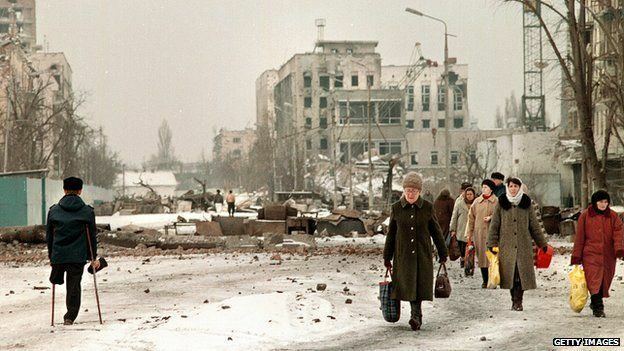 After the re-capture of Grozny in February 2000, the Ichkerian regime fell apart. In response to the increasing terrorism, Russia tightened its grip on Chechnya and expanded its anti-terrorist operations throughout the region. Russia installed a pro-Russian Chechen regime. In 2003, a referendum was held on a constitution that reintegrated Chechnya within Russia, but provided limited autonomy. According to the Chechen government, the referendum passed with 95.5% of the votes and almost 80% turnout. The Economist was skeptical of the results, arguing that "few outside the Kremlin regard the referendum as fair". After the 2004 school siege, Russian president Vladimir Putin announced sweeping security and political reforms, sealing borders in the Caucasus region and revealing plans to give the central government more power. He also vowed to take tougher action against domestic terrorism, including preemptive strikes against Chechen separatists. In 2005 and 2006, prominent separatist leaders Aslan Maskhadov and Shamil Basayev were killed. Since 2007, Chechnya has been run by Ramzan Kadyrov. Kadyrov's rule has been characterized by high level corruption, a terrible human rights record and a growing cult of personality. However, his rule has also seen Chechnya rebuild, with much of Grozny already reconstructed. In April 2009, Russia ended its counter-terrorism operation and pulled out the bulk of its army. Insurgency in the North Caucasus continued even after this date. The Caucasus Emirate has fully adopted the tenets of being a Salafist-takfiri jihadist group through its strict adherence to upholding tawhid, its obedience to the literal interpretation of the Quran and the Sunnah, and its complete rejection of bid‘ah, taqlid, and ijtihad. There are no true districts of Chechnya, but many believe that the different dialects of the Chechen language define different districts. The main dialects are: Grozny, also known as the Dzhokhar dialect, is the dialect of people who live in and in some towns around Grozny. Naskhish, a dialect spoken to the north east of Chechnya. The most notable difference in this dialect is the addition of the letters "ȯ", "ј" and "є" Day, pronounced like the word 'die' is spoken in a small section of the south, around and in the town of Day. According to the 2010 Census, the population of the republic is 1,268,989, up from 1,103,686 recorded in the 2002 Census. As of the 2010 Census, Chechens at 1,206,551 make up 95.3% of the republic's population. Other groups include Russians (24,382, or 1.9%), Kumyks (12,221, or 1%), Ingush (1,296 or 0.1%) and a host of smaller groups, each accounting for less than 0.5% of the total population. The Armenian community, which used to number around 15,000 in Grozny alone, has dwindled to a few families. The Armenian church of Grozny was demolished in 1930. Birth rate was 25.41 in 2004. (25.7 in Achkhoi Martan, 19.8 in Groznyy, 17.5 in Kurchaloi, 28.3 in Urus Martan and 11.1 in Vedeno). According to the Chechen State Statistical Committee, Chechnya's population had grown to 1.205 million in January 2006. According to some Russian sources, from 1991 to 1994 tens of thousands of people of non-Chechen ethnicity (mostly Russians, Ukrainians and Armenians) left the republic amidst reports of violence and discrimination against the non-Chechen population, as well as widespread lawlessness and ethnic cleansing under the government of Dzhokhar Dudayev. The languages used in the Republic are Chechen and Russian. Chechen belongs to the Vaynakh or North-central Caucasian language family, which also includes Ingush and Batsb. Some scholars place it in a wider Iberian-Caucasian super-family. Chechnya has one of the youngest populations in the generally aging Russian Federation; in the early 1990s, it was among the few regions experiencing natural population growth. Since 2002, Chechnya has experienced a classic post-conflict baby-boom. Chechen demographers in 2008 termed highly implausible the reported overall population growth as infant mortality in Chechnya was said to be 60 percent higher than the Russian average in 2007 and to have risen by 3.9 percent compared with 2006. Many experts have expressed doubts about the increase from 1.1 million in the 1990 to an estimated nearly 1.3 million in 2010 following two devastating wars that displaced hundreds of thousands people and virtually eliminated the large ethnic Russian minority in the republic. According to Russian demographer Dmitry Bogoyavlensky, the 2002 census results were clearly manipulated in the North Caucasus: an estimated 800,000 to 1 million non-existent people were added to the actual population of the region. Another Russian demographer, Anatoly Vishnevsky, pointed out that according to the 2002 census, some age groups, like those born in 1950, appeared to be larger in 2002 than in 1989. With the 2002 census, Moscow wanted to show there were not too many casualties and that the refugees had returned to Chechnya, while the local authorities wanted to receive more funds and thus needed a higher population to justify their demands. Also, in the multiethnic republics of North Caucasus normally unlike in other parts of Russia, government positions are distributed among the ethnicities according to their ratio in the general population. So ethnicities are zealously guarding their numbers in order not to be outnumbered by others and thereby left with less representation in the government and the local economy. Some 40 percent of newborns had some kind of genetic defect. Islam is the predominant religion in Chechnya, practised by 95% of those polled in Grozny in 2010. Chechens are overwhelmingly adherents to the Shafi'i Madhhab of Sunni Islam, the republic having converted to Islam between the 16th and the 19th centuries. Due to historical importance, many Chechens are Sufis, of either the Qadiri or Naqshbandi orders. Most of the population follows either the Shafi'i or the Hanafi, schools of jurisprudence, fiqh. The Shafi'i school of jurisprudence has a long tradition among the Chechens, and thus it remains the most practiced. The once-strong Russian minority in Chechnya, mostly Terek Cossacks and estimated as numbering approximately 25,000 in 2012, are predominantly Russian Orthodox, although presently only one church exists in Grozny. In August 2011, Archbishop Zosima of Vladikavkaz and Makhachkala performed the first mass baptism ceremony in the history of Chechen republic in the Terek River of Naursky District in which 35 citizens of Naursky and Shelkovsky districts were converted to Orthodoxy. Since 1990, the Chechen Republic has had many legal, military, and civil conflicts involving separatist movements and pro-Russian authorities. Today, Chechnya is a relatively stable federal republic, although there is still some separatist movement activity. Its regional constitution entered into effect on April 2, 2003 after an all-Chechen referendum was held on March 23, 2003. Some Chechens were controlled by regional teips, or clans, despite the existence of pro- and anti-Russian political structures. The former separatist religious leader (mufti) Akhmad Kadyrov, looked upon as a traitor by many separatists, was elected president with 83% of the vote in an internationally monitored election on October 5, 2003. Incidents of ballot stuffing and voter intimidation by Russian soldiers and the exclusion of separatist parties from the polls were subsequently reported by the Organization for Security and Co-operation in Europe (OSCE) monitors. On May 9, 2004, Kadyrov was assassinated in Grozny football stadium by a landmine explosion that was planted beneath a VIP stage and detonated during a parade, and Sergey Abramov was appointed to the position of acting prime minister after the incident. However, since 2005 Ramzan Kadyrov (son of Akhmad Kadyrov) has been caretaker prime minister, and in 2007 was appointed a new president. Many allege he is the wealthiest and most powerful man in the republic, with control over a large private militia referred to as the Kadyrovtsy. The militia, which began as his father's security force, has been accused of killings and kidnappings by human rights organizations such as Human Rights Watch. In 2009, the American organization Freedom House included Chechnya in the "Worst of the Worst" list of most repressive societies in the world, together with Burma, North Korea, Tibet, and others. Ichkeria is/was a member of the Unrepresented Nations and Peoples Organization. Former president of Georgia Zviad Gamsakhurdia deposed in a military coup of 1991 and a participant of the Georgian Civil War, recognised the independence of Chechen Republic of Ichkeria in 1993. Diplomatic relations with Ichkeria were also established by the partially recognized Islamic Emirate of Afghanistan under the Taliban government on January 16, 2000. This recognition ceased with the fall of the Taliban in 2001. However, despite Taliban recognition, there were no friendly relations between the Taliban and Ichkeria—Maskhadov rejected their recognition, stating that the Taliban were illegitimate. Ichkeria also received vocal support from the Baltic countries, a group of Ukrainian nationalists and Poland; Estonia once voted to recognize, but the act never was followed through due to pressure applied by both Russia and the EU. The president of this government was Aslan Maskhadov, the Foreign Minister was Ilyas Akhmadov, who was the spokesman for Maskhadov. Aslan Maskhadov had been elected in an internationally monitored election in 1997 for 4 years, which took place after signing a peace agreement with Russia. In 2001 he issued a decree prolonging his office for one additional year; he was unable to participate in the 2003 presidential election, since separatist parties were barred by the Russian government, and Maskhadov faced accusations of terrorist offences in Russia. Maskhadov left Grozny and moved to the separatist-controlled areas of the south at the onset of the Second Chechen War. Maskhadov was unable to influence a number of warlords who retain effective control over Chechen territory, and his power was diminished as a result. Russian forces killed Maskhadov on March 8, 2005, and the assassination of Maskhadov was widely criticized since it left no legitimate Chechen separatist leader with whom to conduct peace talks. Akhmed Zakayev, Deputy Prime Minister and a Foreign Minister under Maskhadov, was appointed shortly after the 1997 election and is currently living under asylum in England. He and others chose Abdul Khalim Saidullayev, a relatively unknown Islamic judge who was previously the host of an Islamic program on Chechen television, to replace Maskhadov following his death. On June 17, 2006, it was reported that Russian special forces killed Abdul Khalim Saidullayev in a raid in a Chechen town Argun. The successor of Saidullayev became Doku Umarov. On October 31, 2007 Umarov abolished the Chechen Republic of Ichkeria and its presidency and in its place proclaimed the Caucasian Emirate with himself as its Emir. This change of status has been rejected by many Chechen politicians and military leaders who continue to support the existence of the republic. In 2006 Human Rights Watch reported that pro-Moscow Chechen forces under the command, in effect, of chapter of republic Ramzan Kadyrov, as well as federal police personnel, used torture to get information about separatist forces. "If you are detained in Chechnya, you face a real and immediate risk of torture. And there is little chance that your torturer will be held accountable", said Holly Cartner, Director Europe and Central Asia division of HRW. On March 10, 2011, Human Rights Watch reported that since Chechenization, the government has pushed for enforced Islamic dress code and other traditions which violently repress women. The president Ramzan Kadyrov is quoted as saying "I have the right to criticize my wife. She doesn’t. With us [in Chechen society], a wife is a housewife. A woman should know her place. A woman should give her love to us [men]... She would be [man’s] property. And the man is the owner. Here, if a woman does not behave properly, her husband, father, and brother are responsible. According to our tradition, if a woman fools around, her family members kill her... That’s how it happens, a brother kills his sister or a husband kills his wife... As a president, I cannot allow for them to kill. So, let women not wear shorts...". He has also openly defended honor killings on several occasions. During the war, the Chechen economy fell apart. In 1994, the separatists planned to introduce a new currency, but that did not happen due to Russian troops re-taking Chechnya in the Second Chechen War.